The Warwick trial site is developing very well this year with the warm weather in early spring helping the crops to progress out of winter. The unsettled weather over the last couple of weeks has slowed the crop growth. Leaf 4 is 75% emerged in most wheat varieties at the site and have received T0 spray this week. Currently yellow rust is the main issue with high levels in susceptible varieties. Reflection plots received an application of rust active triazole on the 28th March to hold the disease before typical T0 timing. Disease levels are generally low but where yellow rust pustules were still active an application of Alto Elite at T0 (GS30/31) was applied to give good curative activity. On other varieties where rust was not yet visible Amistar Opti was used to give strong protectant activity against rusts and also protection from Septoria tritici, which is currently at low levels on leaf 6. Winter barley plots are also progressing through the growth stages well, with clear differences between development of the Hybrid varieties compared to conventionals. 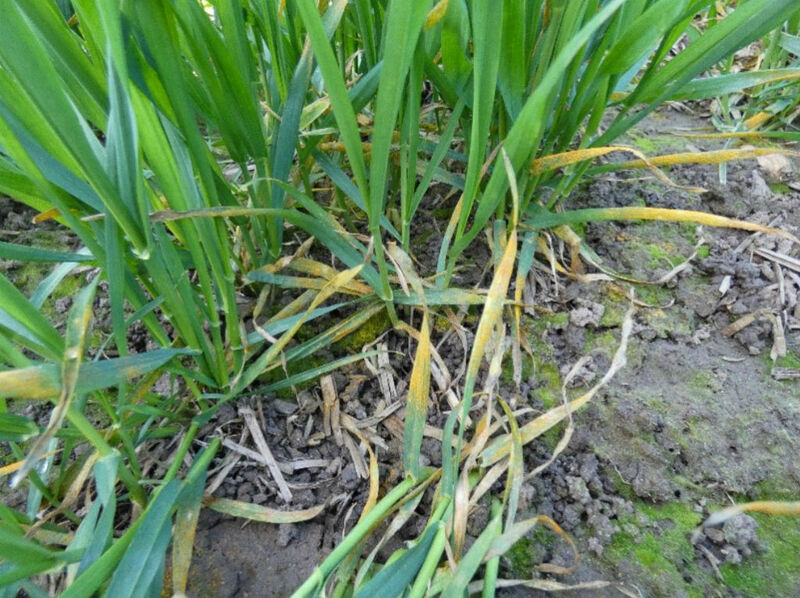 Moderate levels of mildew were being seen out of winter and latterly some brown rust appearing in susceptible varieties. Early disease control in barley is very important as lower leaves contribute significantly to yield unlike wheat (approx. 30% for leaf 4 and leaf 5). A T0 application of Kayak will give good control of net blotch and rhynchosporium, as well as protection of new growth from mildew, with epoxiconazole having curative activity against established brown rust. T1 sprays are likely to be applied in the next week, weather dependent, to maintain disease control from previous T0 application. Both wheat and barley will require strong PGR programmes to prevent root and stem lodging later in the season. This will also retain an increased number of tillers compared to a typical year. Nitrogen applications have also been made in good time this year so crops are looking lush. Moddus was applied at the T0 timing in both wheat and barley to shorten lower internodes and promote lateral rooting. A follow up spray of Moddus + chlormequat will be applied with the T1 applications to compress lower internodes and thicken stem walls. The Fungicide challenge T0 applications were applied on 1st April. The crop of commercial Costello is currently at GS30 and leaf 4 80% emerged on main stem. Low Septoria tritici levels in the crop have dictated T0 options with only 3 teams opting for an application at this timing.